Welcome to our campsite in the Loire region! Located in the Vallée des Rois (Valley of the Kings), amongst the prestigious châteaux, the Yelloh! Village les Voiles d’Anjou will give your holidays a real flavour of authenticity. Really pleasant and family-friendly, this campsite is an opportunity to discover the delights of the Loire Valley with your family or friends. So come and stroll around the wonderful gardens of the Renaissance châteaux, travel down the Loire river by canoe or enjoy the campsite's covered and heated swimming pool. 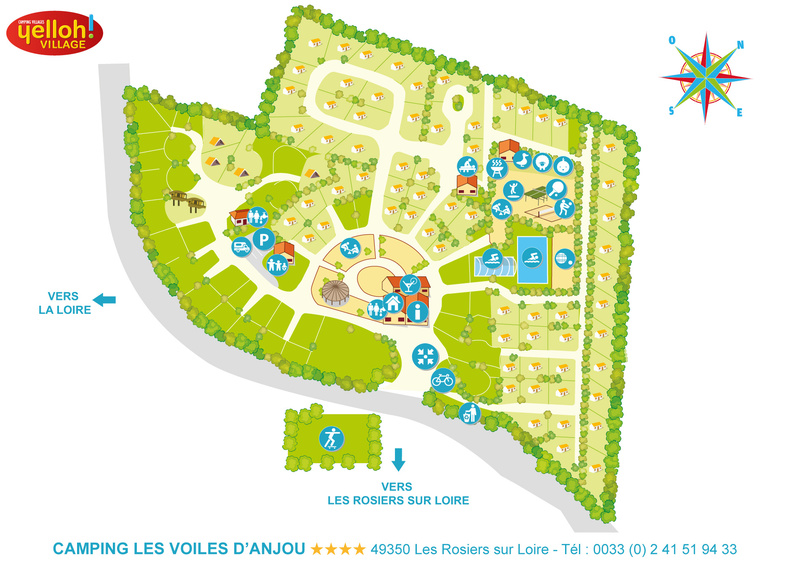 Choose authenticity, peace and serenity when you book a holiday at the camping les Voiles d’Anjou in the Loire region. A very comfortable and well run campsite. Site convenient position to visit the locality. Lovely friendly campsite with things to do for a young child even out of season. The Loire Valley region is a real paradise! Here, the countryside is peaceful, gentle and restful. You'll be able to enjoy some wonderful times close to the wide and majestic Loire river, which you can travel down by canoe, and off the shores of which you can bathe from the natural beaches as well as enjoy walks along its banks. You'll also be amazed by the châteaux near your campsite in Saumur, which include Anger, Brissac and Brézé. Surrounded by wonderful gardens, these prestigious Renaissance-style châteaux will take you on a journey back in time! Close to the camping les Voiles d’Anjou, the countryside of the Loire Valley will unveil itself to you. With its Bioparc, which contains 13,000 rosebushes, and the Terra Botanica theme park, you'll really be discovering the scents and flavours of the Anjou countryside. The Loire region is also famous for its wines. When you come on a camping holiday in Saumur, you'll be able to visit the wine cellars and try some of the local produce. The Loire Valley is a land of traditions and heritage and is full of great surprises, which include the tank museum in Saumur, and the famous Cadre Noir with its horse shows, which will leave you with some amazing memories. You're going to love your holiday in Anjou!